Vietnam plans to continue strict enforcement of automobile import rules, Deputy Prime Minister Trinh Dinh Dung says, amid resistance to the year-old policy from overseas carmakers. Vietnam National Oil and Gas Group has announced its 2018 results, which show it exceeded its revenue and state budget contribution targets. HCM City’s revenues last year grew by 8.6 percent to 378.54 trillion VND (16.3 billion USD), according to the municipal Department of Finance. Those working for PetroVietnam, fully known as the Vietnam Oil and Gas Group, can be referred to as the ‘people who search for fire,’ thanks to their main activity of oil and gas exploration. Vietnam will remain an attractive investment destination in 2019, though impacts of the US-China trade tension that triggered a downturn in global stock markets in 2018 will not end soon, said Managing Director and Chief Investment Officer of VinaCapital Andy Ho. In 2019, Vietnamese stocks may receive some knock-on effects from the highly volatile global stock market. However, the country’s fundamentals remain attractive to investors, and various sectors are nevertheless poised for good growth. You’ve endured the long queues at check-in and immigration; patiently sat on the floor of a packed departure hall after being informed of a delay to your flight; before eventually being told to walk across a baking tarmac to your plane. The Comprehensive and Progressive Agreement for Trans-Pacific Partnership (CPTPP) took effect in Vietnam from January 14, with great expectations that it will substantially contribute to growth in the country’s economy, investment, and trade. The Indochina Rail Tourist Service Company plans to restore the operation of steam trains travelling between the central city of Da Nang and Hue to serve tourists. Truong Dinh Tuyen, former Minister of Trade, said at a recent workshop on the economic prospects in 2019 that Vietnam’s economy has had high GDP growth rate of nearly 7 percent in recent years, but it has relied heavily on FDI. According to the Traffic Police Department under the Ministry of Public Security, the whole country saw 21 traffic accidents with 15 deaths and 13 injuries on February 5, the first day of the lunar New Year. Tennis player Thai Son Kwiatkowski, ATP world rank 275, will become a naturalised Vietnamese citizen to take part in the Southeast Asian Games later this year. Made from nearly 56,000 pieces of pottery, the relief in Ha Long depicts Vietnamese and global heritages. The central province of Quang Binh targets to welcome 4.3 million visitors in 2019, about 250,000-300,000 of them foreigners, and earn some 5 trillion VND (more than 214 million USD) from tourism. Many trade centres and supermarkets started opening their door right on February 5, the first day of the traditional lunar New Year (Tet), with prices kept at the same level before the longest and most important festival in Vietnam, according to market watchers. Thousands of Vietnamese departed for Tet vacation on Tuesday, the first day of the lunar Year of the Pig, reflecting a growing trend among locals to travel instead of staying at home for the traditional festival. The Lao Cai international border gate in the northern mountainous province of the same name was busy with holiday makers on the first day of the Year of the Pig (February 5). Communist-run but with capitalist leanings, and a friend to both the United States and North Korea, Vietnam will host the next summit between Donald Trump and Kim Jong Un from February 27 to 28. Vietnam welcomes the second US-Democratic People’s Republic of Korea summit and strongly supports dialogues to maintain peace, security and stability on the Korean Peninsula. In Vietnam, where e-commerce is developing at lightning speed, the demand for paper packaging has been increasing rapidly because of its advantages over plastic, metal and wood. The sound of water flowing down, the singing of the wild birds – the symphony of nature resounds in the picturesque scenery of Tra Boi Waterfall. HCM City targets reducing the volume of plastic bags used at supermarkets and business centres by 65 per cent, and at traditional markets by 50 per cent compared with 2010. Following the construction of Quoc Tu Giam Temple of Literature in Hanoi, which is seen as Vietnam’s first university, in 1070, many temples of literature were built across the nation. Xich Dang temple of literature in the northern province of Hung Yen is one of them. In the Thanh Hóa diocese, parishes organise charitable and social initiatives. The local cathedral and Catholics in Ba Làng helped tribal people. Mỹ Điểm parish and the Legio Mariae joined forces to help seniors and disabled cope with loneliness. The ancient town of Hoi An in the central province of Quang Nam was among the 10 stunning holidays ideas for 2019 offered by Elle, the worldwide lifestyle magazine of French origin. 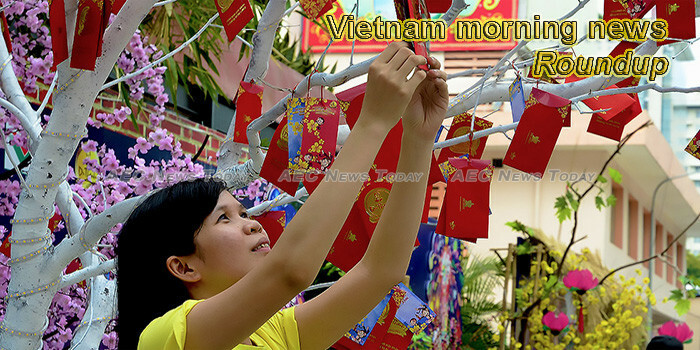 This week’s Vietnam morning news feature photo acknowledges Chinese New Year, 2019.